Men's football in the Asian Games is open to players under 23, and teams are each permitted up to three players over the limit as "wild cards." South Korea avoided such regional rivals as Saudi Arabia, Uzbekistan and Iran, but head coach Kim Hak-bum said he won't take any contest lightly. "I don't think there are any easy opponents for us," he said. "We'll play every game as if it were a gold medal match." South Korea defeated North Korea 1-0 in extra time to win gold medal at the 2014 Asian Games in Incheon, 40 kilometers west of Seoul. It was South Korea's first Asian Games title in 28 years. North Korea will be in Group F against Saudi Arabia, Iran and Myanmar. The Asian Games' opening ceremony is Aug. 18, but the men's group stage will begin on Aug. 14, with the gold medal match scheduled for Sept. 1. 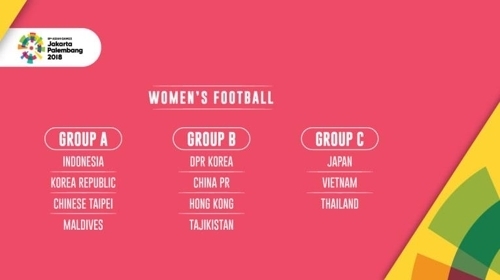 The South Korean women's team, which captured bronze four years ago, will face Indonesia, Taiwan and Maldives in Group A. "Our goal is once again to win a medal," head coach Yoon Duk-yeo said. "We'll aim high as we prepare for the competition." North Korea, which has won three of the past four gold medals, will take on China, Hong Kong and Tajikistan in Group B. Group C only has three countries -- Japan, Vietnam and Thailand. The top three nations from Groups A and B and the top two from Group C will make up the quarterfinals. The women's group play will begin on Aug. 16 and the gold medal game is on Aug. 31.